​In the gripping new sequel to E.J. Russ McDevitt's The Quigley Alchemy, The Quigley Mission launches back into the windstorm of Danny Quigley's life as a former Special Forces operative is called back for one last, highly sensitive mission. Tense and thrilling, The Quigley Mission begins with a flashback to one of the last missions Quigley would ever complete, a Special Forces mission to assassinate a menacing bomb-maker in Iraq. Carrying out his mission flawlessly, he and his fellow operative Scotty McGregor rejoin their troop and return to the U.K. Once there, he is tasked with the burden of cleaning up some of the local pubs that have been overrun by American marine and parachute bullies. Recruited for the assignment based on his superior hand-to-hand combat skills, Quigley's devastating performance in the pub scene makes his reputations and seals his fate. Years later, Quigley, now a financial planner, can be found trolling some of the roughest bars of London in search of the members of a missing Special Air Service (SAS) troop that had only just returned from their mission to then disappear. Even with his civilian status, there's no denying Quigley's commanding presence, a presence that attracts hard-bitten journalist Jacky Spellman to Quigley when researching a story about the kinds of dealings between ex-forces and mercenaries. Unable to shake her and continue his mission for the Secret Intelligence Service, Quigley has no choice but to allow her to tag along as he chases down former comrades, fights trained killers with his bare hands and uncovers a sinister cover-up orchestrated by an alliance between the CIA and imperial security firm, Empire Security. As the plot quickens to break-neck speed, Quigley must follow the trail of his enemies into dangerous shadows if he is to bring them down once and for all. In addition to being an edge-of-your-seat thriller, The Quigley Mission sends a powerful message to readers about the necessity of putting a stop to bullying of all kinds. 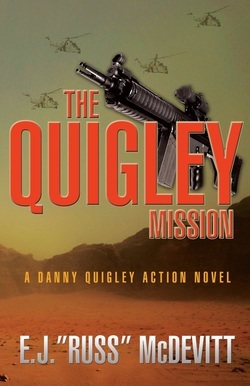 With a lethal dose of action, danger and compassion, The Quigley Mission gets it right.